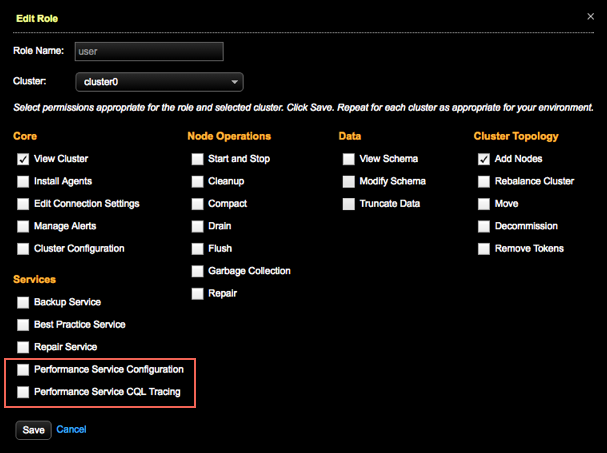 Optionally, set OpsCenter Performance Service permissions for each user role and cluster. Grant configuration and CQL tracing privileges. You must have the admin role to grant role privileges. Click Settings > Users & Roles. The Users & Roles dialog appears. Select the edit icon for the role. Performance Service Configuration: Enables configuration permissions for the OpsCenter Performance Service metrics pages, which allows Configuring the slow query log, Configuring table metrics, and Configuring thread pool statistics. Performance Service CQL Tracing: Enables the Trace feature for the Slow Query Log. Click Save. If applicable, repeat for each cluster in your environment.